In administering a business, expect that you will encounter various kinds of competitions. This is due to the fact that businesses often compete on sales, growth, and development. In addition to this, there is some kind of rivalry between businesses with the same business structures. And both often compete for customers’ or clients’ attention. Yet getting involved in a challenging environment (the business industry to be specific), you also open a door for multiple negotiations with different people and/or other business entities. Having multiple negotiations is considered as one of the many ways for your business to grow, develop, and make progress. An example of this is a restaurant business. The restaurant performance, the management, and the business itself will not make any advancement in terms of the business growth most especially when there are no connections made with other business entities. As you go further, there are different samples for restaurant form templates that are provided for you. These are particularly pertained to making restaurant agreements. 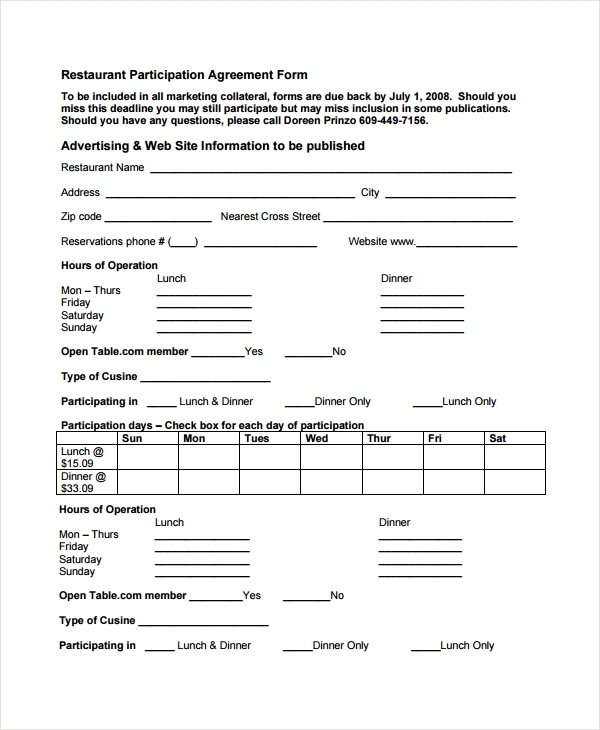 The form provided above is an example of an agreement that is often utilized when you make a negotiation in your restaurant business with another party. 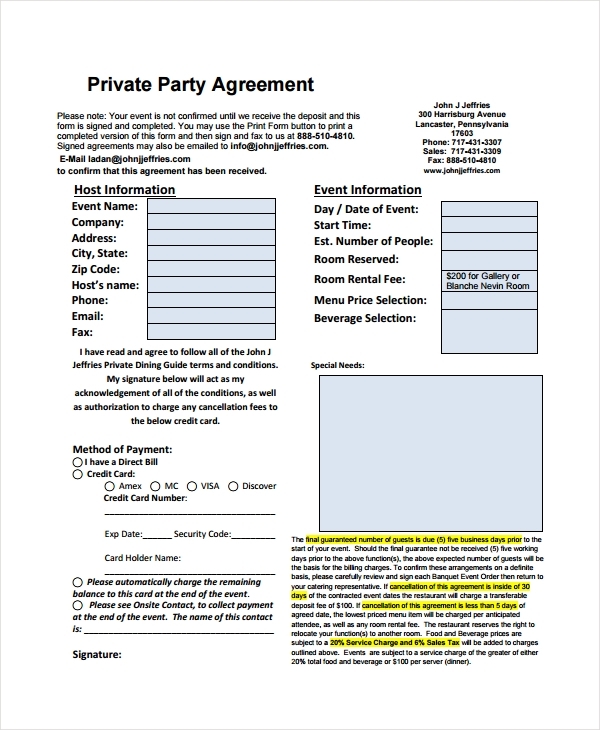 Referring to the form sample above, both parties agree with what they are to provide during an event that will be held by the other. This agreement is further specified in the following information below. In the agreement form for restaurants, all the terms and conditions that are needed to be taken heed of should be specified. An example for this is the specific foods and the beverages that are to be served during the event. The company may request to avoid the display of alcoholic beverages, most especially when the event is held for minor students. Other terms and conditions that should be included in the form are the costs and expenses for the damages that are made to the facilities or utensils offered by the restaurant. All these terms and conditions must be observed by the management. Therefore, a restaurant evaluation must be conducted. And when both parties (the company and the restaurant) are in a full accord, signatures from both should be found in the agreement form. The agreement form is completed when the person inquiring has read and agreed to adhere the terms and conditions that are stated in the form. This is done when the signature is affixed to acknowledge the conditions and authorize to charge any cancellation fees. In order for the restaurant management to ensure that the services offered in the event are successful as expected, a restaurant questionnaire is provided. 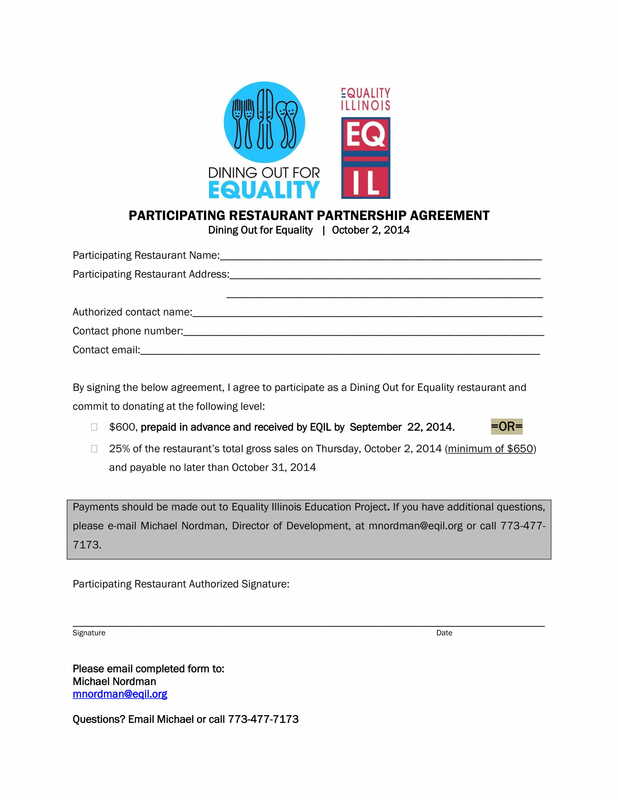 This form sample provided above is an example of a fundraiser agreement for a restaurant. This is often utilized when there is an event that is conducted in order to raise funds for various of purposes either for charity purposes or for other enterprises. A fundraising event is also conducted in order to generate financial support for the future events or projects that will be held. 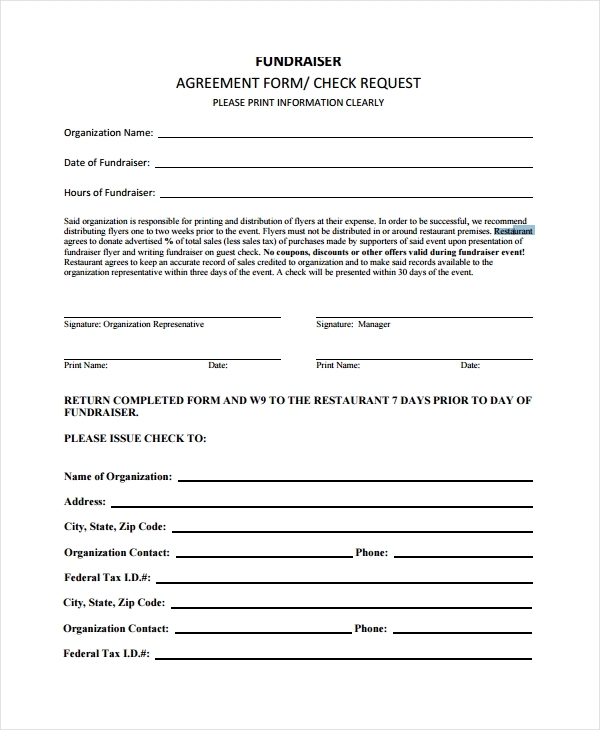 Another example of when you could utilize the fundraiser agreement form is when you have just started off with various of thorough plannings on creating your own business. And for that, you are in need of some financial support in order to build a successful one. Yet, before implementing a fundraiser agreement, you need to obtain all the forms that you need in starting a restaurant business. By means of this, you will have all the documents that you will be needing to show or present when pieces of evidence or proofs are necessary. In order to ensure the effectivity of the fundraiser agreement, the form should be submitted within the specified period of time. And in making this kind of agreement, you have to ensure that the organization or the company, whom the agreement is addressed to, has the authorization access to your accurate records of sales that are credited to them. When all the required information is provided, you have to make sure that the printed names, signatures, and the date of when both of you have signed the form are indicated. The form could also be utilized when the restaurant manager wishes to participate in a bazaar, where different or miscellaneous goods are sold to the public. 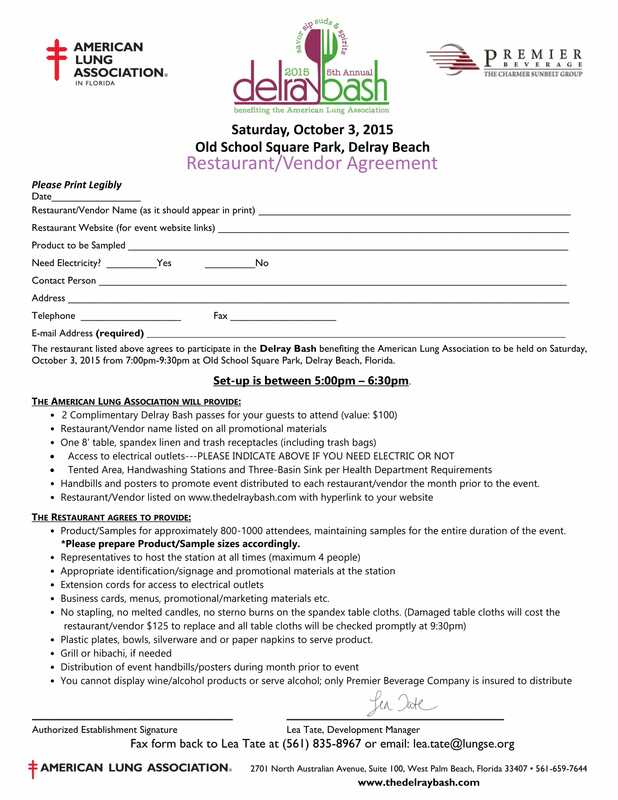 Yet in any event, it should be ensured that everything in the restaurant opening checklist is complete before any event starts and that everything that is needed, such as this participation agreement form, is secured and obtained. 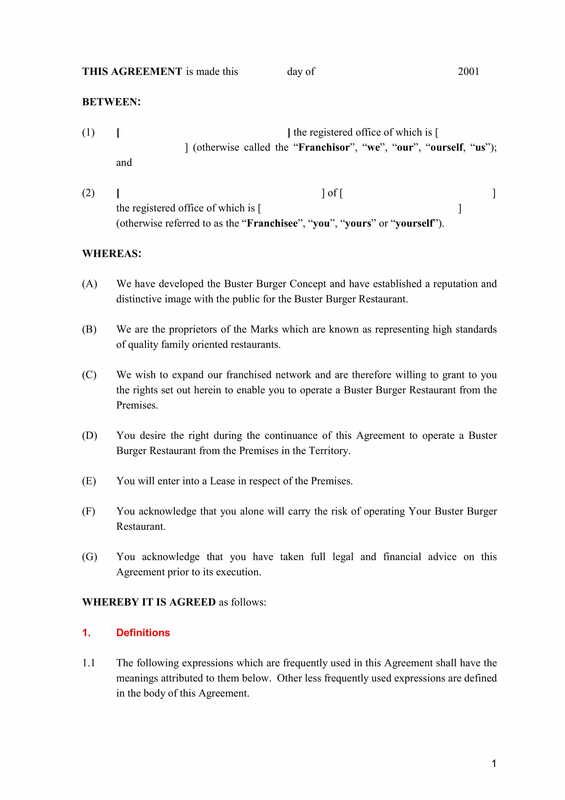 The restaurant partnership agreement form is basically made between two parties agreeing with the same restaurant business plans, either shown by the other party or made by both to expand the business. This form could also be referred to as a joint venture agreement, depending on what both had agreed. Moreover, the agreement should indicate how much each party should provide or donate to develop the success of the event or the business. When everything in the restaurant plan has been discussed, and both are in a formal accord, the signatures from both parties together with the date of when the partnership agreement form is signed should be indicated in the form. the responsibilities of the lessee with regards to the expenses for property’s maintenance, security, operations, repairs, cleanliness, etc. 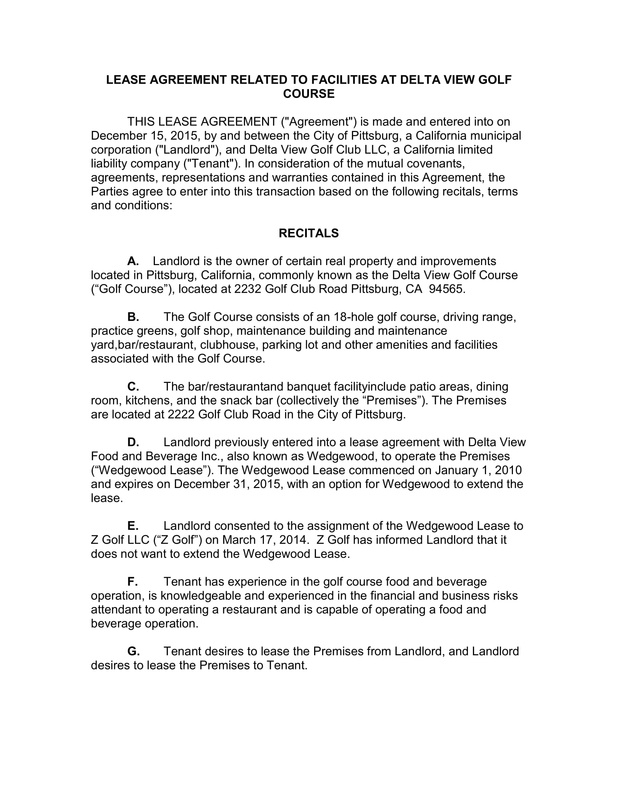 In addition, it should also be specified in this restaurant agreement form that upon the termination of the lease contract, the property should be returned in the same condition in which the lessee had received it. This is agreed by both parties by affixing their signatures in the form. One of the restaurant legal forms that you are to encounter when you manage a restaurant business is a restaurant franchise agreement form. This is basically utilized when two parties have decided to develop and establish a reputation and distinctive image, as well as expand their franchised network and obtain the rights that enable the other party to operate the other from the premises. Agreeing to the terms and conditions with regards to this means they agree to enter into a lease agreement as well. the warranties, suppliers, termination, etc. In making a restaurant agreement in business, it is ensured that all the restaurant operations are accordingly inspected and that a restaurant evaluation must be completed first. Employees from both the restaurant and the kitchen management should be qualified with all the skills and knowledge with regards to their job or work. This is ensured when the business management conducts a restaurant training which will serve as the performance assessment or appraisal of the individual. Therefore, in the business restaurant agreement form, everything in the restaurant operations is specified in details. This agreement form should also contain all the necessary information and should be compiled and documented in the company’s secured or confidential reports. Here are few of the basic tips and guidelines that you could refer to when making an agreement in your restaurant business. Make sure that you have all the terms and conditions that you need to include in your agreement form. If in case that there are some changes that are needed to be made, ensure that you inform the other party with regards to it. Make all the statements comprehensible in order for the other party to easily understand what is written in the agreement. Make sure to provide ample spaces in the form of the information that needs to be filled out, such as the signature and date signed by both parties. Adhere to the terms and conditions written and specified in the form. Be sure to communicate and build a connection with the other party. Be open to some suggestions and clarifications made by the other party. Restaurant businesses are approved when the management is able to identify clear purposes or benefits of creating the business. These should be indicated in the restaurant proposal in order for the authorities to comprehensively understand the objectives and plans that are to be implemented. In the restaurant proposal, it should also be indicated in the form how the management is to handle different kinds of agreements or negotiations. 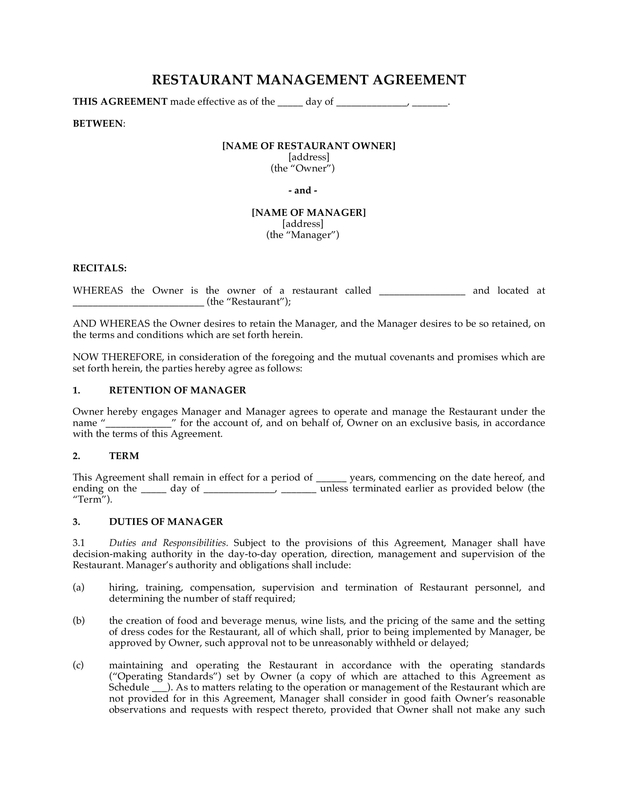 Nevertheless, these restaurant agreement forms are also known as a restaurant contract which could be utilized in order to have a formal accord with another person or another entity. Refer to the following forms that are provided for you in this article, and see the differences between the forms provided. Technically, these agreements are used for a variety of purposes, depending on what these are pertained to. Summing it all up, these agreement forms are to negotiate or legally bind a contract agreement with another company or entity.